On my travels to hike Pine and Wooster Mountain in Danbury yesterday, I noticed the old roadbed of the trolley alongside George Washington Highway. So I returned today to try and document what I could find. From my previous research, I knew the Right-of-Way (ROW) traversed Benson Road and the Sarah Bishop park, so I visited those locations as well. There's a good stretch of the ROW visible from the highway on a winter day. Foliage would obscure the presence of the ROW in the summer and fall. I scrambled through the brambles to take these photos. 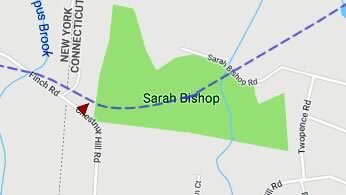 As mentioned, the ROW then continued on what is now Old Trolley Road and veered south on a diagonal to Ridgebury Road. There was a nice stretch of the ROW visible at this location. There was very little to see off Benson Road. Do abandoned trolley roadbeds attract only prickler bushes! :-( The brambles were thick everywhere along the old ROW. The ROW was there but pretty hard to distinguish with all the overgrowth. Looking west at the first curve on Benson Road. A short way in reveals this lovely trail - looks like an easy bike ride on a dry day! There appears to be a horseback riding area here that takes advantage of the old ROW. The Danbury and Harlem Traction company was an interurban line intended to connect Danbury, Connecticut, with the New York Central Railroad station at Goldens Bridge, New York. From 1900 to 1901 the company purchased land, graded the line, laid track and erected wire, and built a powerhouse. Tracks were laid from Danbury as far to Ridgebury and apparently there was trolley service between Danbury and Ridgebury for a year or so. But by 1909 the Bridgeport Herald reported the track ended six miles short of Goldens Bridge. Sadly, due to financial difficulties, the rails beyond Ridgebury were never laid. Finally, the investors pulled the rails between Danbury and Ridgebury sometime between 1910 and 1915 to try and recoup their investment and the entire project was abandoned. I went searching for the D&H Trolley on Monday. I found some of the remnants you found. Didn't find the nice stone culvert near Finch. Do you notice how the railroad is depicted as curving north just south of Ridgebury? That's perfectly accurate. If you go to the curve, now between Benson Road and Ridgeway Road, you'll find two things. One, is a tiny culvert, maybe 1' wide, carrying water from under Ridgeway to the creek with no name that passes closest to Ridgeway. It's lined up at an angle with the curve of the trolley. Second is the culvert for said creek underneath Benson. If you look on the south side, it's a concrete tube. If you look on the north side, it's a stone culvert that is angling away from the route of Benson, but perpendicular to the curve of the railroad. Sure enough, if you look through the concrete tube, you see it meets up with the stone culvert. Russ - Thanks for the continued field research - it's a fascinating story!